From earth-friendly reasons to relationship-building, there are many reasons a shred day is important. It can happen to any organization: boxes and boxes of old documents that should be destroyed are instead sitting around, taking up valuable office space and becoming a liability. This situation can feel overwhelming, but it doesn’t have to. You can solve the problem of records destruction with one big shredding day—and with the arrival of spring, now’s the perfect time to plan one. Need some more reasons? We’ve got seven for you. Yes, you should be destroying records according to a retention schedule, according to your pre-ordained schedules; and you should also be in a “green” mindset year-round. Having a green-themed shredding day on or around upcoming Earth Day (April 22), though, is a great way to bring both of those ideas to the front of your employees’ minds. Shredded material can be used in other products if properly recycled, so a shred day is like a big present to the earth. Theft and in-office privacy breaches can lead to fines and other legal consequences, and fire hazards are an obvious no-no. One way to free yourself from this kind of liability is by having these records destroyed in front of you all at one time, with a dedicated shredding day. Different departments or teams within organizations can sometimes silo themselves, resulting in a fractured work culture. Holding a company-wide shredding day can bring employees together around a common goal—particularly if you make your shred day about more than just shredding. Some of our clients use these days as an opportunity to raise money for local charities or surpass recycling goals. It’s easy to set up an onsite shredding event with Corodata. We’ve got Shred Trucks and a team of shredding experts ready to go. We’ll even help you spread the word to your customers. You’re showing them how much you care about records management and information safety. You can answer any questions they may have about how their information is stored or destroyed—with a cool visual demonstration. You’re providing a fun opportunity to build a deeper relationship. A single day devoted to document destruction can also provide an excuse to remind your employees of the company’s shredding policy and to answer any questions they have about it. Seeing exactly how much sensitive information can be contained by a single document, and how to properly destroy it, can really drive home to your employees just how crucial shredding is to records management. As for the “fun” part, that’s up to individual organizations, but creating a relaxed atmosphere with snacks and music is a good start! See how many documents can be destroyed during the length of one song, and have shredding or Earth Day-themed snacks. When you host a big shredding day, you can plan ahead in order to maximize the amount of documents shredded—and, most importantly, do it on site. By planning a big shredding day in advance, you can request more trucks to make sure all of your shredded material is properly disposed of and additional services like hard drive destruction. There’s a reason “spring cleaning” is such a widely practiced ritual: it’s a big effort that results in a feeling of renewal. In addition to destroying documents on a schedule, this one big shredding day can clear out much-needed space in your office, particularly if you have been putting off document destruction or doing it yourself. Perhaps that space will only be used again to house newer documents that need to be retained, but there’s still a sense of accomplishment in clearing out the old and bringing in the new. Do you know what you are supposed to be shredding? 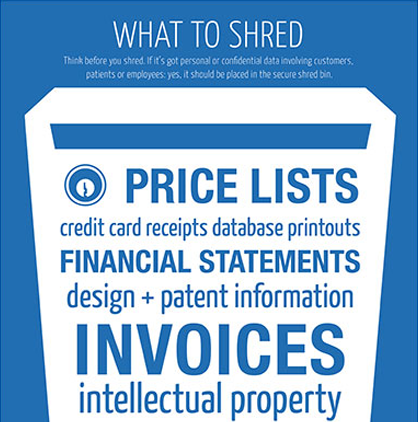 As your company grows and industry regulations change, shredding protocols have also adapted. How knowledgeable are your employees about these practices?